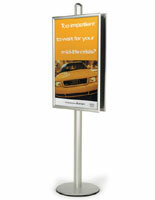 Buy a FORTE Sign Display Stand has a snap frame! 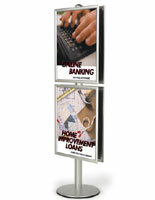 If you're looking for a heavy duty sign display stand that can stand up to years of wear and tear this FORTE display is for you. 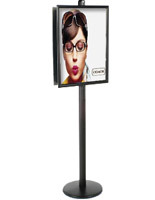 It features 2 snap open 22" x 28" frames with clear lenses. 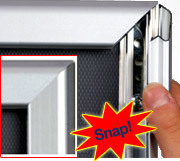 Once you have positioned your frames on the pole all you need to do to is simply snap open each of the four sides, switch your graphics and then snap close each side. 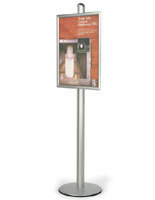 This easy front load style frame has been a favorite of the retail industry for years. 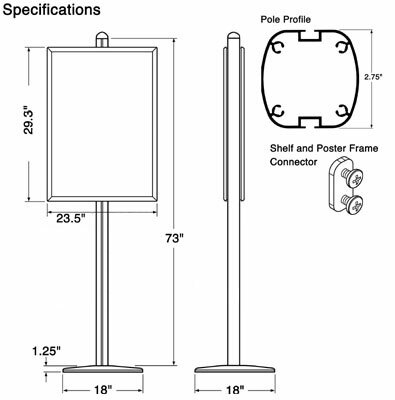 Unlike some sign displays stands that have attractive frames but weak bases or pole, this pole has a 2-3/4" wide brushed aluminum pole with a weighted base. 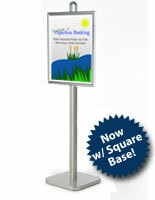 The pole and base alone of this sign display stand weight 25 lbs preventing them from being kicked around, easily picked up or knocked over. 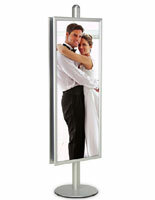 Another feature to this FORTE display is the fact that you can adjust the posters to the height that you desire…as high or low as needed along the 73" pole. 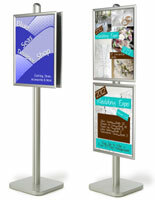 As the sign display stand pictured to the left depicts you also have the choice to show both posters on one side, one on top of the other, or you can place them back to back. Depending on your needs at the time the choice is up to you. Tighten the screws and close the frame. Note: This display is only designed for indoor use.